In blender, add ¼ cup chia seeds, 1 cup cold water, ½ cup wild blueberries, and 1-2 teaspoons of sweetener. Blend for 30 seconds and set mixture aside in separate bowl. In the same blender, add drinking chocolate, 3 cups boiling water, and sweetener (if using) to a blender and blend for 1 minute to fully emulsify chocolate and water. Add ½ cup chia seeds and blend for 1 minute. Pour chocolate pudding into bowl, and place puddings in the fridge for 1 hour or overnight. 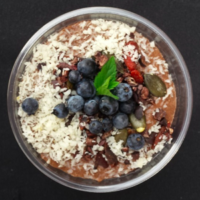 When ready to serve, layer ⅓ cup chocolate chia pudding, jam, fresh wild blueberries, and other toppings. Top with ¼ cup wild blueberry chia pudding and sprinkle more wild blueberries and toppings. Serve chilled and enjoy!